Hanovia recently showed its range of ultraviolet (UV) disinfection and water treatment solutions. Helping those aiming to enhance their biosecurity, Hanovia provided advice on the use of UV systems to ensure water quality within food and beverage applications. 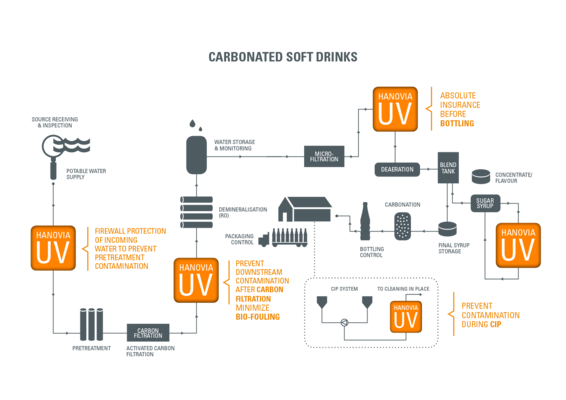 Hanovia also presented its PureLine Ultraviolet Energy Optimised (UVEO) water treatment system, which has been designed specifically for applications within the food and beverage industry. The PureLine UVEO is suitable for high flow rates just using a single medium pressure lamp, which is designed to consume less power than conventional UV systems. The system takes advantage of an optimised hydraulic design to deliver a guaranteed, consistent UV dose with reduced energy and running costs. Hanovia UV systems provide non-chemical disinfection for process, product water and sugar syrups in a wide range of food and beverage applications. With the Hanovia PureLine UVEO, a dedicated solution for the food and beverage industry, the company is able to support the industry’s demand for greater energy-efficiency and lower operating costs.